FLORENCE LATEST: Will It Miss Maryland? WMAR 2 meteorologist has an update on hurricane Florence. There is some good news and bad news when it comes to Hurricane Florence. The good news is that Maryland will miss out on the brunt of the storm. 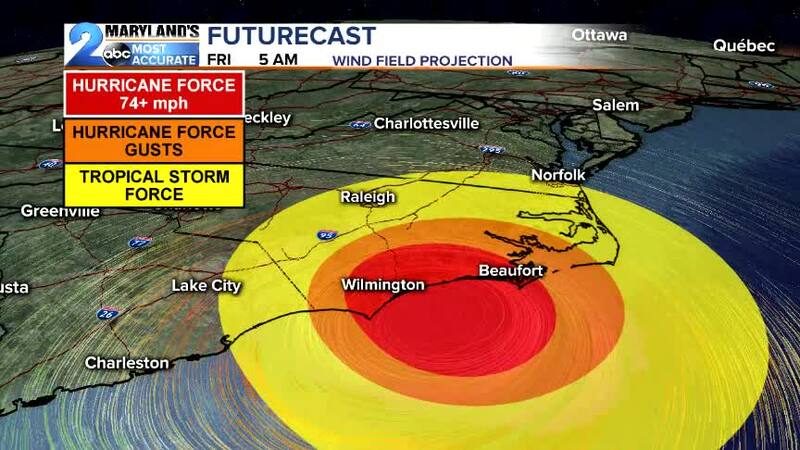 The bad news is that the storm is likely to impact the coastal Carolinas and maybe even Georgia for several days starting (Friday morning and carrying over into early next week). Right now Hurricane Florence remains a Category 4 storm with winds of 140 mph and gusts toppling 160 mph. The storm is expected to strengthen as it moves west northwest at 17 mph into warmer waters of 83-86 degrees. Florence could reach Category 5 strength while en route to the United States but is likely to decrease a little in intensity before meeting the coast. For that reason Hurricane Warnings are now in place for coastal sections of North and South Carolina where mandatory evacuations are underway. Tropical Storm Watches and Hurricane Watches extend from Norfolk, VA down to Charleston, SC and even as far inland as Raleigh, NC. Models remain consistent on a southeast North Carolina landfall with a potential second landfall location down the coast in neighboring South Carolina. All hazards will be on the table for life threatening surge, extreme wind, and big time rainfall. Storm surge by the way is the number 1 leading killer in hurricanes followed by heavy rain/freshwater flooding, wind, and the threat for tornadoes. Our impacts in Maryland though will not be that severe. With the ridge of high pressure close enough to us we will have a barrier from the beastly part of the storm. Yes we will see wind, rain and coastal flooding but it will not be a drastic as our friends and neighbors to the south. The early call from the latest data observations show wind gusts of 15-30 mph starting late Thursday night into the day Sunday. Rainfall amounts on the order of 1-3"+ with the heaviest of those amounts south of US-50 and maybe even as far south as St. Marys /Charles counties. Coastal flooding will also remain a concern with an east to northeast breeze off the water forcing extra water up the bay during tidal periods. Down at the beach in Ocean City impacts may be magnified a bit more. Winds will likely gusts upwards of 30 mph will high waves creating costal flooding and beach erosion. Rainfall amounts even here though will be around 1-3"+ with the emphasis on lower amounts based upon the proximity to the storm and being on the drier flank as Florence moves in. With rough surf though rip currents will remain high so please stay out of the water. All in all we are dodging a big storm here in Maryland but even with that said it never hurts to have a plan of action ready to go. Stack up on supplies and if your in a flood prone area have a place ready to go if you need to seek higher ground. Also don't forget to download our free Stormshield and WMAR2 NEWS mobile apps available at the Apple/GooglePlay stores for the latest info regarding the storm.